Details relating to the Portuguese Commemorative of 2015. 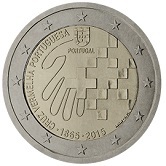 With this coin Portugal commemorates the 150th anniversary of the founding of the Portuguese red cross. The motif shows an open hand – this represents the offering of help to those in need. Also depicted is the well-known cross of the red cross – this is repeated several times, some of the peripheral crosses being incomplete. This represents the expanding influence and effectiveness of humanitarian help both in Portugal and the rest of the world. Around the left hand side of the inner circle from seven o’clock to between eleven and twelve o’clock is the inscription “CRUZ VERMELHA POTUGUESA” From seven to five 0’clock is the year of founding of the red cross and the year of issue of the coin “1865 2015”. Between five and four o’clock we see the mint mark and the initials of the designer – AM. Finally, at the very top of the inner circle is the coat of arms of Portugal. From Portuguese Commemorative 2015 to euro coin collector.